Is there a better combination that chocolate and peanut butter? It is one of those combinations which is now a classic. I am a huge fan of peanut butter cups, and it doesn’t matter who makes it either. In fact, I love those ones that you find in the bargain bin at your local grocery store that you can buy by-the-pound for like $0.25 / lb. I almost prefer them; maybe it’s all the additives. But what I really love are the Peanut Butter Eggs that Reese’s puts out during Easter. There is something about the Eggs that are delicious! I don’t know what’s going on there, but those are the best! And it’s just the Eggs. The other things like the Christmas Trees just don’t taste quite right. 1. Preheat the oven to 350 degrees. Spray two 9-in round cake pans with cooking spray; line with parchment and spray the parchment as well. 2. Sift together the dry ingredients (flour, cornstarch, cocoa, baking soda, and salt) into a medium-sized bowl. Set aside. 3. Whisk together the eggs and sour cream in a separate bowl until well blended. Add the vanilla and mix well. Set aside as well. 4. In the bowl of a mixer with a paddle attachment, mix together the melted butter and oil. Add the water and mix well. 5. Add the flour mixture all at once and mix on low for about 1 minute. Now add the egg mixture in one addition and mix until well blended (about another minute). Scrape the sides down as needed. 6. Divide the batter evenly into the two pans. 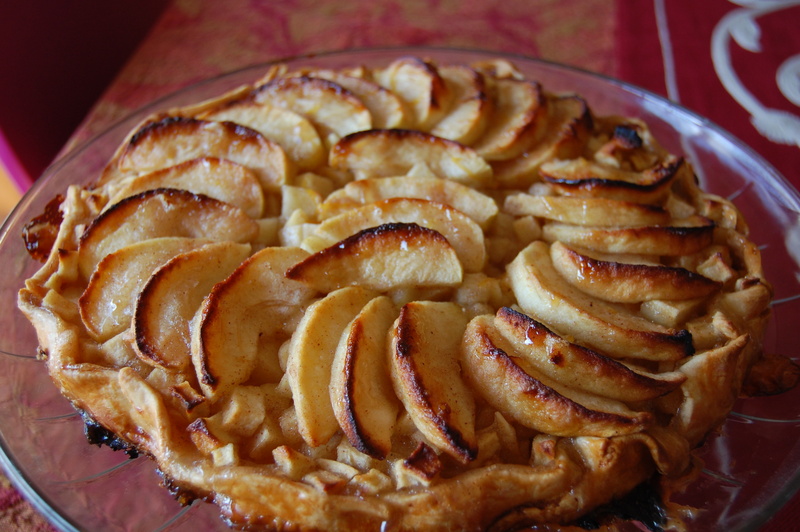 Bake for about 35 – 40 until a cake tester comes out clean. 7. Cool cakes in the pans on top of cooling racks for 15 -20 minutes. Then invert the pans onto racks, remove the parchment liners and cool the cakes completely before splitting lengthwise to make your four layers out of the two cakes.. Using a food processor, mix all the ingredients until smooth and well blended. Scrape down the sides as necessary. To get the chocolaty frosting, I took a portion of the peanut butter frosting and folded in some melted chocolate. But I’ve also folded in a dark chocolate spread before as well. You can also fold in some Nutella or gianduia, that is if you are lucky enough to have some gianduia lying around the house. One day I’ll be able to make this part of my regular pantry items. I like to start by putting a small dollop of the frosting in the middle of a cakeboard round. This helps hold the cake in place. Place about 1/3 – 1/2 c. of frosting on top of the first layer and smooth it out. You can use strips of wax paper in between the bottom cake layer and the cakeboard to help keep it or the serving platter clean. Place the next layer on top of the bottom one and repeat frosting. Repeat with the other layers as well. Smooth out a crumb coat on the outside of the assembled layers and place in the refrigerator to cool for about 15 minutes. Complete frosting over the crumb coat. You can garnish the top of the cake with some of the chocolate frosting mixture (if you made some) and pipe out some rosettes. Notes — One trick you can use is to cut a very small notch out of the cakes before you split them. That way you can line them up correctly so you can get a nice level top. This entry was posted in Cakes, Recipe, Techniques and tagged Cakes, Chocolate, Food, Recipes, Techniques. thanks for visiting! 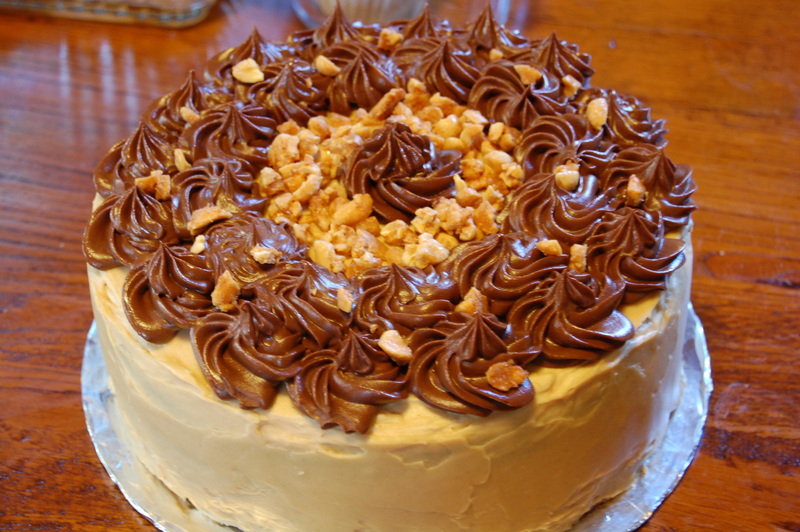 it is fairly popular, but how can you go wrong with chocolate & peanut butter? Delightful! Reminds me of the , only not so insane (four cups of peanut butter for a filling? How many people are they trying to feed?) 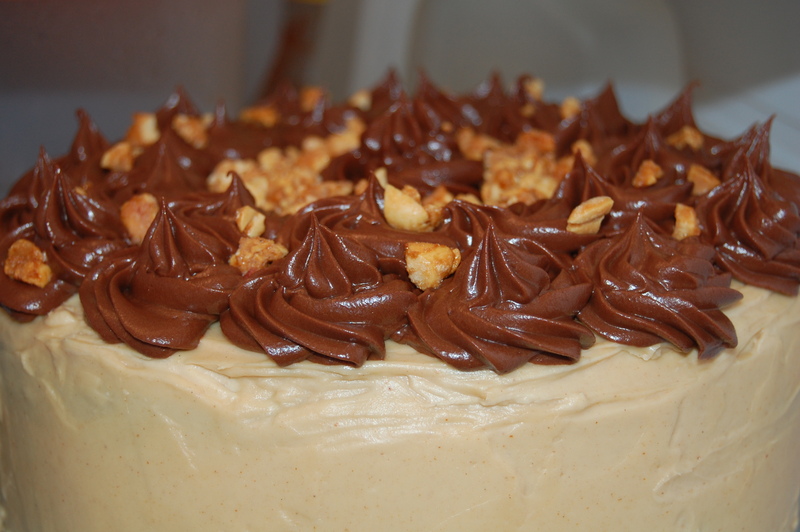 I’ve had terrible luck with peanut butter frosting before; it tends to break. But yours looks fairly straightforward. I’ll need to try it for the Reese’s addict in my life! Wow, that’s one pretty cake! There’s a reason the combo is popular. It’s tasty! Nothing is better than Chocolate & Peanut Butter together ! thanx for stopping by! this cake is one of my absolute favorites as well!